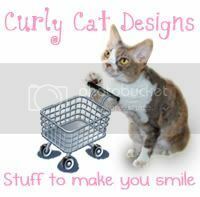 Daisy the Curly Cat: Sunday Comics with Daisy! Lizards are much craftier than I thought. I decided to be nice and invite the lizard to go "swimming." I guess I should have used noodles instead of vegetables for my soup. Because every pool has a Noodle toy. Haha Daisy, yoo neerly got him that time. I love the idea you say vegetables are "pool toys". That is one smart lizard you got there Daisy! Dang...maybe them lizards are smarter than you thought!!! Rats! I guess the noodles would have been better! Miss Bee was sitting here cracking up and I had to go see what was so funny. 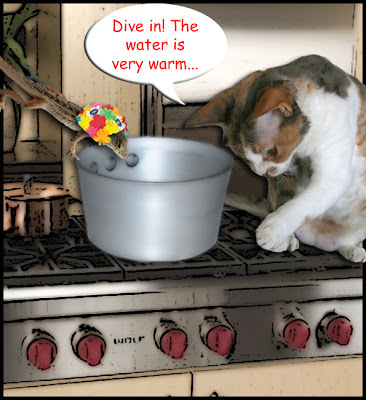 You are a very entertaining kitty, maybe you should be in the newspapers sunday funnies. Oh Daisy, we hope you get one next time! We always love your lizard comics. Mom is cooking too, and since you're far away we'll go hang out with her in the kitchen. That's always worth a try, even though she hardly give us ANYTHING..
hehe I likes the comic today! Maybe you should get the lizards in there first and then add the vegetables/noodles. They seem to be on to the toy angle. Better luck next time Daisy. I guess you can't underestimate the craftiness of those lizards. Keep trying! Good one Daisy!!!! Keep trying. I know you'll get one soon. maybe the pool noodle thingy would work. Who knows? Noodles might have been a good idea, Daisy. Too bad you didn't get to make lizard soup this time. You are too funny Daisy ... I love your comics! And that is a great suggestion to enter my picture from today in the Simply Siamese Spring Is Sprung contest, I will have momma do that! Thanks for the idea! Daisy another excellent Sunday Comic! You have so many ideas, but those lizards always seem to catch on. Maybe you can try to lure one into the microwave and zap it before he runs out! daisy you awaus make us lauf mama had milk come out her nose when she read you comment. i am laffin an laffin! hav u tried "open mike nite?" Da silly lissard wuz wearin a bathing cap! Dat wood haf ruined yur suup. You were cwever to invite him swimming Daisy! But I guess noodle toys might be better. Daisy, you must be quite a famous chef with that commercial gas stove! Perhaps next time you should invite the Lizard in to par boil before you throw in the veggies! Very cute! Your comics are the only ones we read. We don't get a newspaper, so we look forward to yours! Good try, Daisy! That lizard's pretty smart. Daisy, we were just out walking and almost had you a lizard! We'll try again next time. Oh, Daisy, you are so right about the noodles in the "pool" - I've seen those in our pool and I think that may have fooled your lizard! Maybe next time! Daisy, I think that plain lizard would be good enough. But it was a good try! We admire your persistence! Someday you will get the lizard! I hope you try the noodle soup, Daisy. I bet that will work! i'm sorry you didn't get to eat the lizard. Where was Daisy when I needed her?! It was so yukky! Dear Daisy, can you tell Pixie her Bananer Love entry won BEst Other in my contest? I'm finishing the post now but had to tell her! This was a great comic Daisy!!! Good luck fooling him using noodles next time. Your persistence is truly admirable, Daisy! Hey, I was a Lizard Hunter at the weekend! I captured a lizard and brought it inside. Then its tail fell off and I was so busy watching the tail wiggle that the lizard itself sneaked away. To make things worse, Nick took the lizard tail away from me. To make things even worser, all of this happened before Kate could take photos of it to prove that it really happened. But it did! WOWY - them lizards is gittin' pretty smart! I agree, you should have gone with the noodles. Darn Daisy - you are so funny sorry about the soup. 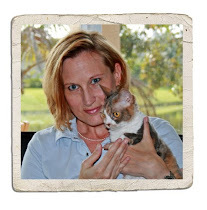 Daisy, just when mom thinks she has seen it all, she reads your blog and laughs and laughs. You are very funny. 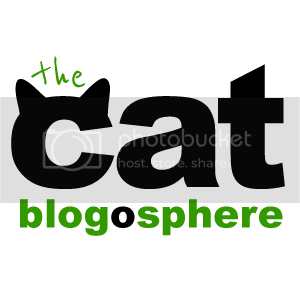 Cute, cute blog. Adorable cats!!!!! Hmmm ... Perhaps that lizard was wise to your wily ways, Miss Daisy. Love his swim cap, though ... an' your chef hat. Charmee's is purple. It would have been a shame to harm that darling bathing cap! You had a good idea there. Just needs a bit of tweeking there! hahahaha Daisy yoo is silly. That was a very clever plan, Daisy. Also, I am sorry I missed your birthday. I hope it is not too late to wish you a happy one!!! That lizard is getting smarter and smarter, Daisy! Daisy, you are wicked to the tail! Your evil ploys are very clever. Of course you could just attack him with your sharp teeth and claws, so I guess it's kind of you to allow him to escape each week. The poor guy should know better than to talk to you. (I don't think the lizards are very smart.) He will need a lizard shrink if you keep up with your Sunday trouble making. Saute the vegetables in a seperate pan. Then the leezerd will never get suspicious. Ooo, Ooo, you could have used lasagna noodles and said they were rafts to float on! 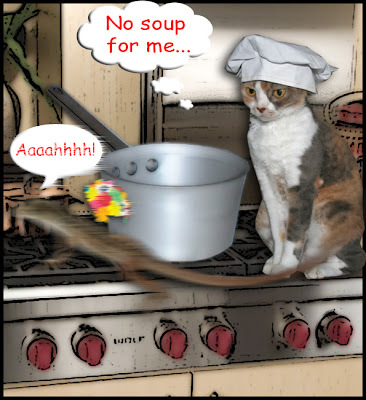 Think your little soupmeat-whoops, lizard-would have believed that? 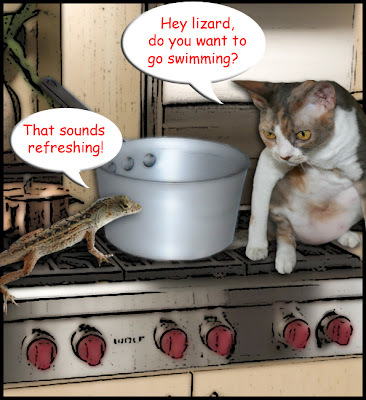 I like the lizard's bathing suit! I love the idea you say vegetables are "pool toys"
me love soups!! Daisy you is so good look with chef hat!! you is look like top chef!! Forget about the lizard, Daisy. You look gorgeous in that chef hat! 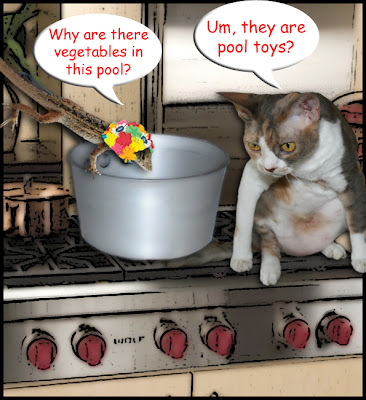 Hehehehehe - we love the lizard's swim cap!